DMO Flight Design has posted this promo video from the soon to be released Sikorsky S-92 for X-Plane 9 and X-Plane 10. The International X-Plane Engineering Group has posted another development update from the 737-300 for X-Plane. Philipp Münzel has posted FMS Preview Part 6 from the soon to be released Ramzzess Boeing 777-200LR for X-Plane 10. The freeware Pacific Ranges Photoscenery - Machmell River for X-Plane 9 and X-Plane 10 is available at X-Plane.org. The VertigoStudios Grumman F9F Panther V1.2 for FSX is now available at 38% off with free expansion pack. The recently released Carenado Cessna C208B Grand Caravan for FS2004 is now also available to purchase at SimMarket. The recently released TropicalSim Rio de Janeiro-Galeão Intl. Airport (SBGL) scenery is now also available for FS2004. MilViz is currently holding the first ever sales event with 50% discounts an all products. Valid through Sept 5th 2012. LatinVFR has released the Bermuda L.F. Wade International Airport (TXKF) scenery for FSX. Available at SimMarket. - TXKF (BDA) airport completely modeled with significant attention to detail. - Surroundings extremely detailed, most mayor hotels in the area, and other important landmarks. - Hundreds of hand placed static boats and ships. - All islands covered with photo scenery with hand placed autogen, featuring the entire island chain, and photo real water in FSX. Turbine Sound Studios (TSS) has posted another preview video from the upcoming Airbus A330 HD Sound Package. Open source flight simulator FlightGear version 2.8.0 has been released. Details at the FlightGear Website. - Improved aircraft models and textures. - FlightGear has been synced with the JSBSim project. - Region-specific terrain textures are used for Europe and Hawaii. Now towns in Europe look different from towns in the USA. - Cities and towns now look more populated due to random 3D buildings, complete with lighting at night. - Scenery looks more realistic due to improved placement of random objects, buildings and trees. - Airport signs are now rendered in 3D, with support for double-sided signs. Full apt.dat 850 syntax is supported. - You can now select between summer and winter scenery in-sim. - A new flexible, 2D rendering system designed for complex instruments such as CDUs, MFDs, EICAS, HUDs and other glass cockpit interfaces. - Canvas allows aircraft designers to easily build complex instruments without needing specialized C++ code. - Support for translation of the main menu into languages other than English. - A Nasal API is available allowing access to Navigation and route-manager data. - Airwave Xtreme 150: complete new (JSBSim) flight dynamics, new model, advanced pilot animations. - Various improvements to our scenery database make it easier than ever to add, delete or update objects to the FlightGear world. - The new aircraft download page allows you to easily find quality aircraft, by filtering on status indications. - Improved simulation of atmospheric light scattering with terrain haze. - An experimental renderer, named after the famous painter Rembrandt, is included for testing purposes. -- Rembrandt rendered supports multiple light sources, real-time shadows and ambient occlusion across aircraft and scenery. - A French partial translation of The FlightGear Manual is now available. FSAddon has released the Lockheed Hudson and Electra package for FSX. Details at the Silver Cloud Publishing Store. FS Magazin has release another free bonus article (german language only). Download at the FS Magazin Website. Hervé Sors has released Navaids Update 1209 for FSX and FS2004. Available at the Flight Simulator Navaids Page. Flight One Software is currently offering $10.00 off the ATR 72-500. Valid until August 22nd 2012. Drzewiecki Design has announced development of Polish Airports Vol.1 - Version 3.0 for FSX, FS2004 and Prepar3D. Drzewiecki Design has released Polish Airports Vol.3 for FSX and Prepar3D. Details and purchase at the Product Page. Carenado has announced development of the Beechcraft Baron 58 for X-Plane. More information on Facebook. Blue Sky Scenery has released the freeware Dubois (KDUB), Washakie Wilderness photo scenery for FSX. Eric McClintock has posted FSBreak Episode 116: X-Plane 777 and the demise of Flight at the FSBreak Website. Cekko has posted new preview screenshots from the upcoming Embraer EMB 120 Brasilia for X-Plane. More previews and videos have been posted from the upcoming RAZBAM McDonnell Douglas AV-8B Harrier II for FSX. The freeware Krasnodar International Airport (URKK) 2.0.1 beta for FS2004 is now available to download at AVSIMrus. PC Pilot - Issue 81 - September/October 2012 is now available to purchase at the PC Pilot Website. MilViz have announced their first ever sale with 50% discounts an all products. Starting Aug 17th through Sept 5th 2012. Lionheart Creations has announced the soon-to-be-released Robin DR.400-180 for FSX and Prepar3D. 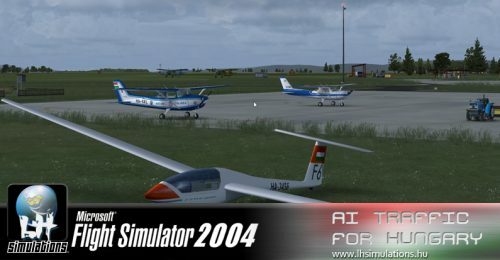 LHSimulations has released the freeware Hungary AI Traffic Pack for FS2004. Details and download at LHSimulations. FlightGear has updated the world scenery database to version 20310. Details at the FlightGear Website. Richer Simulations has posted this seasonal terrain preview from the Grenada Airport (TGPY) and Island scenery. Drzewiecki Design has posted more preview screenshots from the upcoming FSX version of Polish Airports Vol.3. Blue Sky Scenery has released the freeware Yellowstone National Park, Part 2: Yellowstone Lake photo scenery for FSX. Alabeo has posted another livery preview from the upcoming WACO Classic YMF biplane for FSX. LimeSim has posted more preview screenshots from the upcoming Aerosoft US Cities X - Los Angeles scenery for FSX. Aerosoft has posted random screenshots from the upcoming A-Flight Helsinki-Vantaa Airport (EFHK) scenery for FSX. A2A Simulations has posted the August 2012 Development Update video on YouTube. Leading Edge Simulations has posted this development update on the Saab 340 project for X-Plane 10. The freeware Cerfontaine Airport (EBCF) scenery for X-Plane 10 is now available to download at XPFR. TruScenery has announced development of Helsinki-Malmi Airport (EFHF) for X-Plane 10, FSX and Prepar3D. Tom Curtis has posted this promotional video from the recently released Final Frontier scenery for X-Plane 10. The LHSimulations Győr-Pér International Airport (LHPR) scenery for FSX and FS2004 is now also available at SimMarket. AVSIM has posted an interview with Mathijs Kok on the upcoming Aerosoft Airbus X Extended for FSX. QualityWings has added more preview screenshots from the upcoming FSX version of the 146/Avro RJ Collection. Project Airbus has released the updated Fly By Wire module for FSX. Details and download in the PA Forums. Skysoft Simulation has posted preview screenshots from the freeware Xi'an Xianyang Intl. Airport (ZLXY) for FS2004.